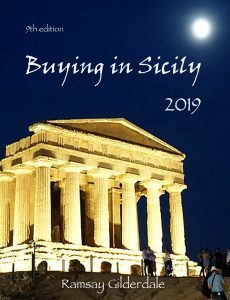 You can get hold of your copy of Buying in Sicily online – and your downloadable PDF will be sent as soon as possible. It’s not an automatic download, but we try and reply within 24 hours. What’s more – it will be updated completely free for the next 24 months – so any changes in the law, or news from the property market will be mailed to you, automatically. If you decide to buy via Amazon in a format more suitable for your reader – then please remember to forward us a copy of your receipt and your email address to ‘updates(at)buyinginsicily.com’ otherwise we won’t be able to send you your free updates.